So, Google Reader is shutting down in three days. Have you left choosing a new reader until the last minute? Me too. I have some good news though, Feedly has been hustling and is now browser based and easy as pie to sign up for. Yay for procrastination. Feedly is becoming the hub for a bunch of other services too, you can read all about it right here. 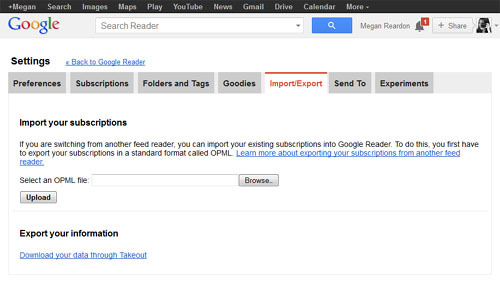 Back up your Google Reader feeds. Go to the Google Reader homepage and click on the gear in the upper right hand corner of the screen and choose “Reader Settings”. You go to a page with tabs, click in Import/Export. At the bottom you’ll see “Expoert your data – Download your data through Takeout”. Click on that, it’ll take you to a new page. Wait for it to load and then click on the red “create archive” button. Download and you’re done, high five. You won’t need this archive to migrate to Feedly, but you will want to have it. For posterity. Or in case you decide to use a different RSS reader. Go to Feedly. If you’re like me and you have not signed up for Feedly yet you’ll see a page with the option for “One-click Google Reader Import”. Click on that, sign into your Google account, accept those terms and that’s it. You’re all finished. Sweet. I don’t use Google Reader to bookmark and save my favorite posts. (I put them here on this site, a habit I started pre-RSS. Gasp this site is old.) But I will note that Feedly also imported the few things I did mark as favorites inside of Google Reader, so you won’t lose those bookmarks. Digg is also racing to be the Google Reader alternative, see this article at Wired: Inside Digg’s Race to Build the New Google Reader. I’m curious to see how that will work out. Update: Also see this guide to the best readers by GigaOM, and a tool to help you get all your data out of Reader from somebody who used to work on Reader, the reader_archive tool. Both via Waxy. Another update: The equally easy to use Digg Reader is available now. Also, Anna at Door Sixteen also likes Bloglovin’. What Google Reader alternative have you adopted? Do you use a reader? Or do you look for blog updates on Twitter and Facebook instead? I went with newsblur instead, after trying out a slew of others (feedly, bloglovin’, the old reader, feedbucket, hivemined). Glad everyone seems to have found replacements that work! Recent Feedly convert here. I did shed a few tears when I heard about Reader being killed though. Okey Dokey…… I did as you said. Everything moved just fine, buttttttt how do I get back to it once I close. Hep me, hep me, please. Jess – I have to take a closer look at NewsBlur, it was recommended over and over and I hear they updated the look in the last month. Thanks! Peetu – Me too. It’s been with us so long, it’s not very pretty but I’m going to have some separation emotions in a few days. Ann – As long as I’m signed into my Google account Feedly is showing me my feeds. Is this not the case for you? What’s going on? Maybe we can figure it out. How nice of you to try to help this non-techy old lady. I just couldn’t find it when I wanted to put the bookmark in my toolbar. Found it by going to History. Now if only I can figure out how to alphabetize the unread items, I’ll have it made. Thanks for your offer of help. Much appreciated. I am using Feedly. It was easy to set up and I enjoy the fact that I can use a regular web browser rather than a separate app on each device. I went with CommaFeed, at least for now. I was very pleased to discover that CommaFeed includes one of my favorite Reader features– the ability to add a “Next” button to my browser so I can read posts on the actual websites instead of in the rss reader. I’m considering switching to Tiny Tiny RSS eventually, since I already have a machine I’m hosting an XMPP server on. Time will tell, I suppose. CommaFeed is certainly the lazier option. Am I the only person who just visits the blogs I like every day to check for updates? I hate not seeing the actual site they’re on. … Well now I feel all old. So, I kinda feel silly that my first comment is a link, but…even after using Feedly for a while I found this pretty helpful! If you’ve not seen it yet. Bubbles – No, you are not! I know a lot of people who do that, and I have a few sites I check more often and keep in a folder so I can open them in a bunch of tabs. And when I do want to read a full post I click through and read it on the site, even if the full post is in my reader. But, I follow a lot of sites now so keeping them in a reader is a better option, and skimming them is faster in a reader. I tried a few when GR first made their announcement. I didn’t like Feedly because it felt too much like a magazine and it also didn’t seem to mark these as read very easily. I tried The Old Reader but that didn’t update very quickly and some of my blogs NEVER updated (like SLOG). I finally landed on InoReader. It also has a super easy GR slurper and the format is very similar. Plus completely free and I have a lot of blogs that I read. Done! Thanks for the step by step instructions! I’ve settled for bloglovin’ simply because it has the equivalent of a ‘Next’ button, which was the one feature I really really missed in Feedly. Bubbles and Megan, commafeed (and Reader) allow you to view new posts on their actual websites. thank you carry on the tip about inoreader! finally, a reader that offers “updated only” on the list of blogs. i really really need my list to shrink as i zero out the unread entries, else i spend way too much time scrolling. this is the first i’ve heard of inoreader and soooo glad i took the time to read all the comments. and, thanks also to martha! I’m another ex-google reader user over here. 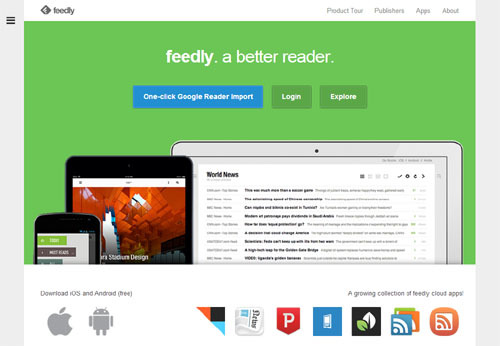 I switched to Feedly a few days ago, and I must say that I find myself loving Feedly more and more. It’s very easy to use, which is always plus! I have also settled on InoReader for now. I use an old iPod Touch and a laptop and none of the other options really worked on the iPod. No app required, just a mobile website I can use. Google Reader was pretty much perfect for me, so I’m still bummed about it all.